Premium Marine Polish is simply the best polish you can buy. The special polymer coating provides unmatched protection against UV rays, seal the surface to repel stains and deliver a deep, long-lasting gloss. Application is simple, whether by hand or with a buffer; apply, let dry to a haze and wipe off. Use once per year to keep new and restored boats looking their best. Ideal for all fiberglass, metal, glass or painted surfaces. Note: if surface is oxidized or hazy, use One Step Heavy Duty Cleaner Wax. Before polishing, wash surface to remove grit and dirt (we recommend Star brite Boat Wash or Star brite Sea Safe Biodegradable Boat Wash). Shake bottle well. Apply evenly with a clean cloth to a small area in a circular motion while polish is wet. 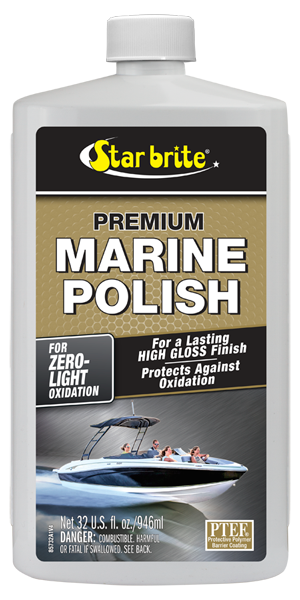 Star brite Premium Marine Polish will quickly dry to a haze. Wipe off haze using another clean, dry cloth. For best results, apply a second coat within 30 days. Two applications will provide exceptional protection against fading, chalking, rust, corrosion and general degradation. Oil, dirt and salt will not stick to the super slick surface and can usually be washed off with boat wash and water. NOTE: If surface to be treated is faded, chalking or oxidized, first use Star brite Premium Cleaner Wax to restore the finish."